Home » Again the SOHO space probe records “huge spherical object” that emerges from the sun. 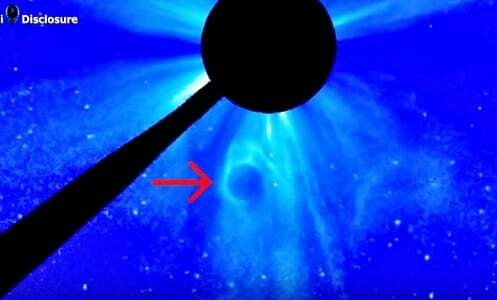 Again the SOHO space probe records “huge spherical object” that emerges from the sun. On December 24, 2018 the SOHO Lasers Lasso C2 and C3 captured a large spherical object that emerged from the sun. Once again on January 7, 2019, both satellites captured another spherical object leaving the surface of the Sun. According to some ufological researchers, these spherical objects are huge dimensional portals or StarGate used by alien ships to cross stellar systems and reach our neighborhood. Since similar spherical objects were seen near the sun that were clearly not coronal mass ejections, others believe that the phenomenon is only due to a plasma discharge. We are currently in a solar minimum, which is the period of least solar activity in the solar cycle of 11 years of the Sun. During this period the sunspots and the activity of solar explosion decrease, and often do not occur for a few days, which leads us to wonder if the spherical object was actually a plasma discharge or not. The video below shows the moment the phenomenon is recorded by the SOHO probe. Life on Mars? “Flock of animals” captured on the Red Planet !! UFO sightings in the USA MAPPED: Where are you most likely to see alien craft in the US?